This is Luke's family page. As you note by the background of course he is our star. To check out his official records go to the ROM Master located on the bottom of Calcurt's home page under "Luke". Here we want to share part of his untold story with you. Hopefully you will find your own Sheltie star. As you read about Luke's family you may see the special gifts that each one has to offer. So whether you have a new show dog or a wonderful old timer or the best pet yet, do enjoy the Luke family story. Luke was one of four male puppies born February 28, 1972. It was their mother's second heat and first breeding. 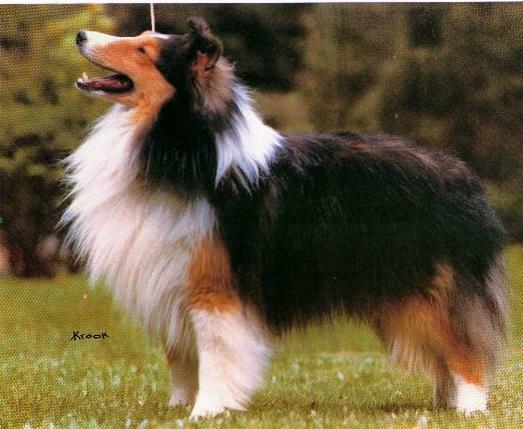 I had chosen Ch.Halstor's Peter Pumpkin because of his linebred Sea Isle pedigree and beautiful balanced type. It was a breeding of like to like in many ways (Angie's parents crossfaulted which is my usual breeding mode). This time I had enough strong breeding on both sides to trust they would produce like. And the pups looked so promising at birth that I grew the whole litter out until they were over five months old. They were named in order of birth. Matthew was always the pretty one of the litter. He was the largest but since both parents were moderate (Angie 14 1/4") I was not worried and he stayed at or under the size charts for his ages. Mark looked like a small Matthew and when sold was running quite a bit under the charts; I learned that he matured to 14". Luke was the "sleeper" of the litter. His head planes were so strong at three days which I remembered when he went through awkward stages (and I still judge my pups at this early age with good results). He was not as balanced as his brothers growing up, though always elegant and very striking (I think that good angulation takes growing into). He was often aloof even with his siblings as if he knew he was different (and special). He was rugged and not afraid (neither bullied nor a bullier) but preferred to play by himself rather than the rumble tumble of four adolescent Shelties. John was the smallest although very typey and sold the earliest as a pet, before the other three visited Macdega. He is typical of my line which may produce a 13" or so typey individual. Angie's mother was from a litter of seven and there were two pretty little ones in that. So I knew John could go as a beloved pet and he did mature to 13 1/4". That trip to Macdega with my three promising boys was quite an experience. I had wanted their opinion (to see if they agreed with me that keeping Luke made sense even though Matthew was so glamorous). Growing out a litter that long is really enlightening and you learn a lot about all the pups (and get pretty attached, too). I had never imagined that Tom would want to buy Luke, but when the offer was made I had a hard decision to make. I knew he was special but also realized I could not promote him. 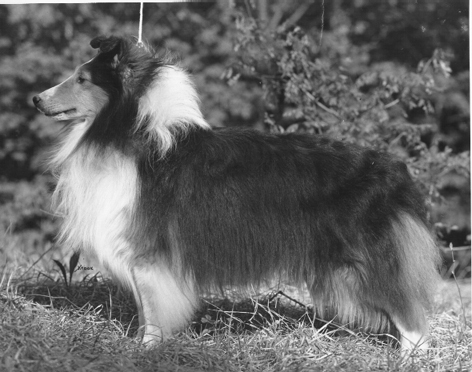 His grandfather, Silver Talisman of Pocono CD was an exceptional Sheltie and only used 10 times while here (mostly by us) which I knew was a loss. Luke had a right to more than that. I will never regret the decision to let him go. The part I did miss was the pleasure of living with him and knowing him as an adult. But that special puppy will always remain in my memory and has helped me to pick out other Calcurt pups to continue the line. If you're interested in more history, the following will tell you of Luke siblings. There were six Peter/Angie litters from 1972 to 1976 with proper skipping heats and puppy raising times for Angie to enjoy motherhood, which she obviously did. Considering the fact that I do not show dogs so these pups had very limited chances for exposure, the number that did get out definitely show that Luke was not a one time success. The depth of this combination continues in my present pedigrees which also contain James from litter#5 and Paul from litter#6 as well as Luke himself. Let's start with the litters in order. Of course Luke was from the first "gospel" litter described at the beginning. The second litter born May 21, 1973 was the "All In The Family" litter, in order of birth, Archie, Edith, Gloria, Mike and Lionel. Gloria was another of our little gals and matured to 13" as a beloved pet. Edith was 15" and purchased as a show prospect had 2 points (I believe) when unfortunately lost. Lionel as a pup slipped his lead at a match show with his new owner and was hit by a car and killed. This was definitely my hard luck litter. 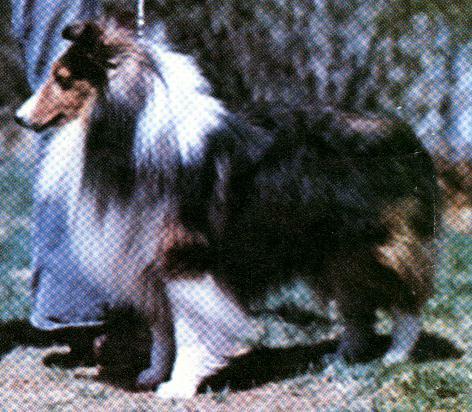 Mike 15 3/4" was purchased by Bob and Gail Carpenter (Woodbridge Shelties) and had just taken a major under Lynette Saltzman (Catamont Shelties) when lost in the Heatherland kennel fire. And Archie 15" who had gone as a pet not because he wasn't lovely but because I had three nice males, came back to visit as a lovely neutered (as I advise for pets to limit animal population) individual. So as far as I know nothing carries on from this lovely litter. What a loss! The third litter born February 26 1974 contained only three individuals and we almost lost the first boy who then was named Lazarus for his resurrection. He matured to 15 1/2" I heard but lost track of him after that which is always the possibility with Sheltie kids since communication is a two way street. The girl had to be Martha who matured to 14 1/2" and became Angie's second (and only other finished) champion in 1979. The last boy was Thomas who went with Carol Watt (Delmantha) for a while but came back here later. This boy did go somewhat over size though I never got his exact height(definitely under 17")I did keep in contact with his owners. He naturally herded cattle when visiting a farm in the Midwest and also saved his family from an electrical fire by waking them up that night. Some non show individuals are priceless. The fourth litter was also born in '74, October 12 to be exact as Angie had gone eight months between heats and with the Lazarus problem my vet felt skipping would not be advisable. There were five bouncing babies, all very pretty but considered rather small for their time. As we were busy with our own children these pups went as pets except Peter who I understand became a Bermuda champion. This was our "Narnia" litter with Peter 14 1/2", Susan 13 1/2", Edmund 14 1/2", Lucy 13" and Caspian 14 1/4". Litter number five was born July 10, 1975 and named after an early Curtis family. William 15 1/2", James 15 1/2", Caroline 14 3/4", Charles 15 1/2" and Helen 13". At this point we were still busy with our children and these pups all went as pets except for William who did get several points including a major I understand and may have carried on for Betty Stadler of Sealect kennel. Fortunately James ended up with a family near us and we were able to use him with a daughter of Jomar's Happy Miss Tam (Angie's grandmother described under her picture) by Ch. 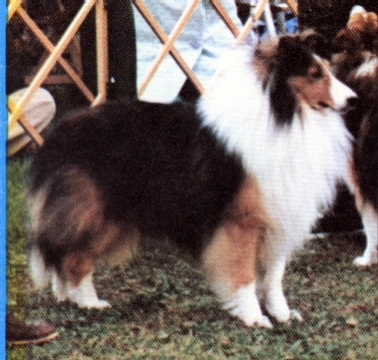 Shurdale Stormking Jock (Page's Hill and Note breeding). She was named Lithshire Ginger Snap. James and Ginger produced Stuart's Star of Calcurt CD who produced Calcurt Bonfire when bred to the last Luke son, Ch.Canden Macdega Coming Home. Check pictures and pedigrees and you can follow that line to Calcurt High Hopes. James himself was a lovely refined individual probably the most like Mike we had produced. He only produced this one litter but we're glad to have the connection (however hard to find). The last litter was born April 27 1976 and contained three boys. Continuing our biblical theme we named them Paul, Timothy and Titus. I lost track of Titus so didn't get his mature height though he was in the middle of the litter as a pup. Timothy lived locally and matured about 14". Paul stayed here and matured to 15 3/4". Although he never got his official CD because we weren't showing in obedience any more with family activities overshadowing, Paul was taken to 4-H obedience classes by our daughter Virginia and earned first place at graduation. He was an elegant individual with very little white and lovely length of neck which actually was enhanced by the silhouette look. Calcurt Copper Cameo (Brandy, mother of Calcurt Fawnwood Lion's Share under pictures and pedigrees) reminds me very much of Paul. Although Paul does carry on through a son he was another hard luck story for us. I was tempted by the show bug and sent him to an individual to be shown. Unfortunately when he was picked up at the airport the person who got him decided to walk him that night to go to the bathroom. And when the poor dog heard an airplane overhead he jerked loose and ran and was never found. This was a difficult loss especially for our daughter who had worked so well with him. I guess showing isn't meant to be for us. In any case the people who lost him sent us a son, Shandon Monarch Eclipse who you will find in our pedigrees as sire of Calcurt Red Alert to Calcurt Princess Nichol to Calcurt High Hopes. So if you've followed all this so far you now have the story. Luke had several quality siblings, many of whom were never shown and some who were tragically lost before they could finish. We actually trace to two of them, James and Paul through Calcurt High Hopes. She was well named for hope carries us on through the problems that naturally happen.